You may have heard that once you get a DSLR you need to learn to shoot in manual and only ever use that mode. That if you are using the Aperture or Shutter Priority you’re cheating and if you want to be more like a pro you have to shoot in Manual only, all the time. To that I say “horse pucky”! (if you’re old enough to remember M.A.S.H. you’ll get that reference). Note: if you need an intro to Aperture or Shutter Speed check out our introduction to Aperture and our introduction to Shutter Speed. The three manual shooting modes what are they? Aperture priority: (A on Nikon, Av on Canon) this mode has you in control of two of the three exposure controls: ISO and aperture. The camera will select an appropriate shutter speed to give you a correct exposure. Shutter priority: (S on Nikon, Tv on Canon) this mode once again puts you in control of two of the three exposure settings, this time it is ISO and shutter speed. 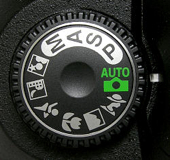 The camera will select the aperture for a correct exposure. There are of course other factors involved that will affect the exposure such as what Metering Mode you’re using and Exposure Compensation. More on the latter later. I usually select my ISO first, based on the lighting conditions I’m shooting in. If it’s bright sunlight I go to 100 or 200. If it’s subdued light, shade or overcast I might bump it up to 400. For indoors or dimly lit rooms I may go to 800 or higher up to 3200 if necessary (you need to test to know the upper limits of your ISO and where you’re comfortable shooting with your camera, mine will yield pretty decent results even at 6400 and beyond).How I know I’ve gone high enough with the ISO, is if I have a fast enough shutter speed to eliminate camera shake when hand holding. If I’m on a tripod, I’m usually shooting a ISO 100 or 200 because I can use any shutter speed safely. Just because the camera is picking the shutter speed does not mean it will give you a nice sharp image. Yes it will choose a shutter speed to give you the correct exposure, but if you set up your camera for ISO 100 at f16 in dark room you’ll wind up with a pretty slow shutter speed like 1/2 of a second perhaps, and without a tripod you’ll get blur from camera shake.So keep your eye on the shutter speed the camera is picking and if it is too slow (I suggest you follow the 1/focal length rule for minimum shutter speed – for more on getting sharp images read my article 5 tips for Getting Sharper Images) readjust the ISO, the aperture or both – picking a higher ISO will help, so will choosing a larger aperture like f4 as that will let the camera pick a faster corresponding shutter speed. There is often confusion among students about using Exposure Compensation when in Manual mode. This behaves differently depending in the camera you have, in Canons for example it just doesn’t apply, as it is has no affect. When using a Nikon if you shift the Exposure Compensation to say +2 what it does it adjusts the scale you see in your viewfinder to reflect that so if you then set the exposure to match the “0” mark it will give you a +2 exposure. I’d personally find that even more confusing, so if you want +2 just set your exposure in Manual so that it shows +2 on the scale. Tell me what you do and if you find this information helpful. I appreciate your summary. It's a very fit conclusion and well said. If I may though I think you meant "A and S is for..." And again, "The article is a very good primer for leaving “Auto"." As we know A and S are auto modes, they just aren't called "Auto". I think those 3 modes have there uses. in my personal opinion I think "m" mode is for shooters who have time to fiddle and explore ones imaginations without limits. A and P is for situations that need speed and one is comfortable trusting the camera to pick the settings for them. or you can always put the dial to "P" and use a predefined setting with fill flash. :) the article is a very good primer for leaving the "Auto" modes. Darlene, wonderful article. As an amateur who has been struggling with this issue, your clear and brief explanations of A & S (I have Nikon D100) have been the best I've come across. I am looking forward to using these modes more often, now that I have a better understanding. Thank you! Not much argument on that one, almost everyone recommends using raw! including me. @Ray yes good points. I do use my camera in Av mode with flash though sometimes. But you are 100% correct you really need to keep an eye on your shutter speed. While I tend to use one of the automatic exposure modes (aperture priority or shutter priority) more times than not, the one situation where I ALWAYS try to remember to shoot manual is when shooting with flash. I've had a few too many instances when using flash where I forgot to switch out of aperture priority mode and ended up with a shot taken at a very slow shutter speed, albeit with flash used as fill. In those instances where you know you need to use flash, it's best to choose the ISO, aperture and shutter speed desired and then let the flash act as the remaining exposure variable. Excellent clear and concise article. Empowered me to make use of the technology available in Av and Tv modes. Now, how about an article on the best uses of raw and jepg . Well maybe this will come to an end because Paul has brought me around Darlene. I can see how in a busy event staying in Manual may be detrimental. Basically this would require a situation where overall light was changing on your subject and the background relatively the same amount, this change was faster then how long it takes you to get a Manual shot ready (for me about 10 sec at the very longest), the luminance difference in your background was small enough to not trick auto modes to completely messing up the exposure, and you didn't need to present the finals all together showing same skin tones (as in a wedding album). Let's say you're in a RAVE club with lights going off and on or something. I've never found myself there but I can imagine it happening. Fact remains, this is a great article and I will continue pointing people to it. @paul - thanks for that! @Peter - re: why articles usually reference Canon and Nikon - because they are the big two and I'd say the biggest majority of SLR users have one of those two. I work part-time in a camera store and we sell comparatively very few Pentax, Sony and other brands. I don't know percentages but if I had to guess I'd say all the rest of the brands would be less than 30% combined. So it's simply writing for the majority and unfortunately you're right some are left out. But it's often not feasible to cover ever brand and ever model, just too much. Sometimes in my classes I show Canon and Nikon and if there are other types of cameras in class I get them to bring their camera manual and we look it up. So it's really just a reference or starting point. @Mark thanks for your comments and compliments but I'm still going to disagree that yes each much choose what is best for them. Comparing to shooting with a lens cap on is just silly, that's not the same thing and you know it. ;-) I also teach an HDR class and I talk about what is bad HDR - from MY perspective. If my students want to make over saturated, haloed, no contrast, overly detailed messy images - far be it from me to tell them it's bad if they like it. I always say this is MY opinion and mine alone. I do not profess to have all the answers or to be "right" - each needs to choose their own path. And guess what? Most people that start off doing bad HDR and thinking it's good - end up seeing the way I do eventually too, it just takes them some time. So why not let them have that journey of self discovery and learning? Mark : I believe you are messing up two different things : "camera mode" and "light metering". Basically, your point is, "don't rely on the internal metering of the camera, it will produce neutral grey weighted images or the camara's interpretation of the image, and this is not the exposure you'll want to have". Having lived long enough to operate cameras without any built-in metering (that doesn't make me old yet) or cameras like the Nikon FM with built-in metering but only manual mode available (go figure, that really existed for many many years, even in DSLR's), I have to say your point is right. Measuring light is best done out of the camera, where you subject is, either by measuring reflected light (on a person's skin, very good choice at least if the skin is not very dark by nature, or on a neutral grey card you'll have with you), or by measuring the light source itself on the spot (a Lunasix light meter will allow that with a specific cap to put on the cell opening). But it does not imply manual mode photography is the only sensible way to go. I've done it, and too often I find out I'm forgetting to adjust exposure when I change scenes or subjects, getting caught in the action, so I sometimes waste my time and make a lot of badly exposed pictures. But I've been successfull with manual exposure too, when it's the way I choose to go. What is always needed, whatever the mode is we take (A/Av, S/Tv, but also P or even M when reading the internal meter exposure), we must interpret the values we see, and use exposure correction accordingly : overexpose a little to get white stay white, or underexpose to keep shadows in the shadow range and not some middle of road greyish image. The advantage of your method is, given _stable_ light conditions, is that you set the exposure once and for all, and "freeze" it into your camera settings, with your choice of ISO / speed / aperture, and it won't change at all wether there's a light, or a dark object, in the foreground or background of your image. There are disadvantages too : 1) if light conditions change, (and they often do, both inside and outside), you need to rethink all three values or at least adjust one of them. 2) if some very light or very dark subject comes around, you may be too close the the dynnamics of your sensor to be able to get enought detail on that specific subject. Your way of doing things requires long training with your camera to be able to "read" lighting conditions well enough to rely on a spot metering you do on your hand or on the subject's skin and translate that in settings your camera will treat well. It reminds me of the time in film emulsion cameras when we were told not to change film brands too much, because once your are used to a sepcific film emulsion's results, you could easily blow up highlights on another type of film you hadn't tried yet with the very same settings. So to come back to the original subject : Darlene has a very adequate description of what the different modes in the camera allow to do : make a decent choice of what you want, control depth of field with A-Av mode, or control motion freeze/blur with S/Tv. Or control it all with M manual. Or let the camera calculate an optimum for you with P (which I use a lot when doing "technical documentary" photos that must be done quick with maximum chance of no blur and best definition / depth of field available). All of these modes (including manual if you rely on the internal meter) still require you to think : if your subject is dark, you'll want it dark on the photo, which you can do by underexposing a bit, and if your subject is light (or surrounded by light), you'll need to overexpose a little to compensate. Or you can rely on your postprocessing, which for darkening images or highlighting them a bit is not so much of a problem, except if you have really "blown" light area's or "dead" dark shadows. For the readers that are still with us after this long answer, happy photographing ! Theory is nice to know, it will help you progress making better photos, but so does practicing. Just stop once in a while and thinkabout where your choice is : motion control, depth of field control, or plain out of the box fast images. Nothing's forbidden ... and Darlen'es advice is brilliant. I don't think that all things are right for each of us except convincing others that their is a best way. It's actually self-defeating since convincing others there is a better way is a way that can't be wrong, according to your own statement. This "everything is right except saying something is wrong" is a funny notion the west has adopted in the last hundred years and is not very logical. If someone is taking pictures with their lens cap on would you let them because it's working for them? You said, "This article is for absolute beginners who’ve not mastered using these modes and is a starting point only." Right, it's for people to learn Aperture and Shutter Speed. But then go on to agree with others and say auto modes may be better in some situations. I'm saying the exact opposite. If you know Aperture, Shutter speed and ISO and have the time to learn a couple very simple camera settings then Manual is a better way to get an exposure. It's also a "better" way to use exposure for creative effect. You say you'd be in Manual for those situations two situations I mention. Thats exactly why I'm trying to say Manual is better in every real world dynamic lighting situation. There are two affects happening in my two scenarios (that you say you would use Manual for) happen nearly all the time, just sometimes to a less of an extreme. That's not how P mode works on Canon cameras. P mode handles exposure the same as full auto with the exception of being able to choose a different AE mode, Evaluative, Spot etc.... The other non exposure related things is you have control of are the flash and focus settings. So P may put AE in evaluative metering so it looks at a different part of the scene when it completely automatically changes Aperture and Shutter Speed. The end result is the same, you have no real control of exposure. Any slight change in background lighting will cause the camera to shift the shutter speed without your permission causing a negative effect on the entire scene's exposure. Maybe Nikon's P is different. I do understand how Nikon's odd EV compensation works. Since this is the reason you say you giving up on M and give the camera control of exposure I think though you have a misconception of what Manual Mode can do for you. If you understand the basics of your camera and want better exposures from you camera then you are getting now then go to my blog and leave a comment and I'd love to help. Hi Darlene..Thanks for a great article.Yes, this is a good explanation for beginners like me. I am using point and shoot camera with capability of shooting manually. i have to admit that an articles like this help me a lot to learn, and learn about taking photos in different situations. Agree with Jeff that we need a lot of practices. It is us that make the photos good not the camera. thank you very much.... this article was very much resource full to me..
G'day Darlene..excellent tutorial..wonderful work..please tell me this..how come that every tutorial I read assumes that the reader has a nikon or canon camera? I use Sony as I was a fan of Minolta in the past and still use the older Minolta lenses on the Sony ax77..a little heavier than the modern range of lenses but give wonderful results..I will certainly follow your posts in future as you come across well and explain clearly..cheers from Australia..Peter..
One of the best articles I have seen in a long time. Well done, Well written. Thank you! @dougs yes that is correct Program is different again. I tend not to use Program either as you still aren't making many decisions the camera is. There's also smart auto or iAuto on some cameras, and many different scene modes. I still suggest getting off all those and using Av, Tv, and M.
One thing to point out that isn't mentioned in this article is that the Program mode "P" is not the same as Auto. On Auto, the camera tries to guess what you are shooting and then makes changes to your camera to take a picture that is best for that scenario. This is great when it works, but sometimes (a lot) it guesses wrong and you get a sunset picture when you wanted a picture of your kid at their birthday party (or the other way around). While Program mode just selects the settings that will give you a properly exposed image. I use the program mode when I just want a shot that is exposed correctly and isn't too far out of range of what my camera can handle (shutter speed not too slow for handheld, or aperture too large for a bright day). However, I'm not afraid to choose another setting to get the results I want either. As for the exposure compensation when using Manual mode, I find it intuitive on Nikon (but maybe I'm just used to it). I find that my D40 will usually slightly over exposure so I set it to -0.3 a lot of the time. If I leave the -0.3 in there and select Manual, then I know that the exposure it thinks it is getting is still offset that amount to what I see as correct exposure. Unfortunately, you have to do some math in your head to work out the numbers, so what happens is that I never use Manual mode. I just select A or S and then adjust my exposure compensation to match what I wanted with a manual selection. This would be a problem if you go outside the range of you exposure compensation though (usually around +/- 3). where I would use Av or Tv and the pros I know use them more for speed and productivity. Since I like to take outdoor fine art and landscapes I really take my time and full manual is the way to go. I just get better exposures. There is no way I would teach anyone to start in manual. Keep up the nice work! @marius yes valid point! There are so many other options though in a short article you can't really cover settings for every brand, so I just do the big two. They'll be similar in other models just consult your manual if you have a Pentax, Olympus, Sony, Panasonic or something else! Thankyou for this tutorial, It has helped with a number of things I was having trouble with. Darlene well written agreed its for beginners looking for more control over the outcome than just AUTO. In fact I teach ongoing workshops in St.Louis in our Beginner workshops (avg 3hours) I begin by teaching in a quick go to moment that there is no shame in selecting a preset its better than auto. As we move on we always teach the Semi Manual modes AV and TV as most beginners still leave with their heads spinning . Those two settings alone are a load for a beginner to learn. We teach fundamentals of depth of field , shutter speed , ISO and White Balance. @mark I was going to reply to all your messages and comments but you lost me after the last one with 8 paragraphs! Let's just agree that we each must choose the mode that works best for us and not try and convince anyone else our way is the only way, or the best way for everyone - and move on, shall we? @ jvw said "There is no ‘only right way’ to do anything. Aperture, Shutter, and Manual all have their usefulness in different circumstances. This article is a beginner’s introduction to different shooting modes"
yes that's exactly my point thanks! "Darlene, what would you do if you had to photograph a 4 year old standing in snow with dark trees behind him on an overcast day? What mode would you be in?. What would you do if you wanted to shot him from high up and have the snow behind him in one shoot and down low with mostly trees in the next shot?" I'd shoot on manual, yes! In no way did I say what I described about is a one size fits all situations. I'd also use manual if the church had a window at the back that might cause sudden backlighting. If there is no window I'd probably use Av though. This article is for absolute beginners who've not mastered using these modes and is a starting point only. I checked out your blog. I love your images. You're a fortunate man to live somewhere so beautiful. You guys should check it out. The 4th image, "A Beautiful Waterfall in Himachal Pradesh" has some great lines. Picture the bubbling white water as the subject. He put leading lines pointing to the story from the top right to the subject. Also from the bottom to the subject. The leading lines were created by choosing a long shutter speed. It's very effective. Great job. If you'd like Mridula to send me your email I'd love to tell you how, based on what post processing computer you have, you can get the grey in the waterfall white. The AV mode you choose thought you wanting the water to be middle grey, not white the way it looks in real life. It's a simple 5 second fix in anything from Picasa to GIMP to to Aperture 3 to Lightroom 4. If you go to my blog and make a comment anywhere you'll be able to leave me your email without having to give it to the entire internet. You can look me up in Google + as well. I love your first image on there. The horizontal white water is on the bottom thirds and the lines of the water all lead to it. I really love your eye. The images are beautiful. I used to go only for M initially but these days I have been playing around with Tv and Av. For example this waterfall was Tv because I wanted to control the motion. And I have to say I am happy with the results. Yeah that would be ridiculous. It'd be like saying everyone should use AA batteries when they power their toys. That's crazy! That kind of battery has a purpose and is designed to do one thing. Using it out of what it can do would be just silly. Using an auto exposure mode when trying to take a picture of a person in a dynamic lighting conditions when it's your job to get the exposure correct (or you're super serious hobby) is choosing the wrong tool. I'm not saying everyone should use Manual Mode only. I'm saying thats the next step after Aperture and Shutter Priority. It's faster, easier and yields better results every single time. This is true in in-door weddings, outdoor weddings, at parks, beaches, in the snow or on a mountain top. For those pro's that don't use only Manual and shoot in a dynamic lighting scenarios then they are making it harder to make creative use of exposure on their subject. It's true that a lot of pro's don't use manual. It's also true that a lot of pros make a lot of mistakes. Customers don't always know what they are missing. New "creative" instagramish effects can hide some of those mistakes as well. Using them as a metric doesn't really make sense. Tod, those "tools" you speak of in an abstract way is a light meter. A reflective light meter attempting to get middle grey. This is true of snow or a black dress. It's nothing fancy or mysterious. This is a very useful tool i you use it to decide what exposure you want and then don't let it adjust further. It will give you a bad exposure if you let it control the exposure. In Aperture priority it's reading the light and adjusting Shutter speed to make middle grey (or a different exposure if you choose) of what it sees when you go to take the picture. The problem is if it's in any of it's metering mode, evaluative, spot or averaging it will read the scene (not the subject) and change your shutter speed for you to get the spot or center weighted average or whatever at middle grey. You do not want it to do this . The center circle (in spot) may have something bright or dark, the scene may have something bright or dark (in another mode). You can use EV compensation to adjust for this, but the moment you move the camera all these things changes. You say pros do this. I agree they do. I was watching Creative Live a few weeks ago. A sweet professional photographer was walking us through a typical wedding live. He was in Aperture Priority. They were in a mock up wedding chapel with side windows streaming in light. He was taking pictures of the bride walking down the aisle talking about where and why he was standing in certain places. He then went to do some family portraits. He put the family in front of a window. He was explaining to us how he was posing. I told the chat audience that he was going to mess up his exposure. I said it will be under exposed. He shoot the picture and all the faces were too dark to see any details. He dialed the EV a couple stops and shot again. He shot again and it was still too dark. He said this happens alot in AV when shooting by light. He said he usually just shoots alot of pictures and takes the best one. The problem is if he's taking the best one for exposure then he's not taking the best one for expressions on the face, or for the best focus. What if there was a technique that was faster and had all the shoots the right exposure? That would be ridiculous to suggest to use this method. Why was I right and this pro teaching all of us wrong? Two reasons. One his choice of Aperture priority. Two, because I had one thing on my mind and he a thousand. Posing people, composing the shoot, explaining this to thousands of internet viewers, dealing with a wire hanging from his camera. This is exactly why he should have been in manual mode. Once you set the exposure for a subject to light situation, which takes about 2-3 sec, your mind can go to the other thousands things you have to deal with. Your exposure will be spot on, every time. I'm not trying to sound like a know it all. I know exposure. Aperture and shutter priority do not give you creative control of exposure in any real world dynamic lighting situation. If it's super dynamic the exposure will be unusable. Manual mode is not for everyone. That's ridiculous. It's for those who already know what effect on exposure ISO, Aperture, Shutter Speed have. It's the next step to this wonderfully written article. It's not for everyone. It may be for you though. If not yet, get those concepts down so you can learn how the light meter in your camera works, what to use as a reference in the field and how so you can get better exposures more consistently. Use luminance as a compositional technique just like S-lines and diagonals are. Light and dark are the compositional piece you always have and every shot. Don't fight with them, or let them happen by accident, use them to tell your story you envision with the photo. For all the people who say you should ONLY us manual, that is ridiculous. I know of many high end pros who nearly always use AV or in some cases Tv, the camera contains tools to help you take the best possible pic. No matter what mode you use if you don't understand composition, lighting etc you will end up with an at best average shot. I appreciate what you say because its 95% true. I write photo instruction articles for a blog. In my instructional articles I probably will never write one on this topic because this one is so complete, accurate and helpful. The one thing I disagree with is that Manual Mode is better if... In fact RAW is better too if... So I'm glad you brought that up. Dane with manual, as I said. Once you've mastered the concepts of aperture, shutter speed and ISO it's better. Using manual is not for beginners. But it's also true that using aperture priority is not for someone who just picked up a camera for the first time. Learning where the shutter release is should come first. Manual Mode is better if... I'm my opinion manual mode is always better in every situation. That's all I'm saying. I'm allowed to "challenge" Darlene because this is my opinion and this is a blog. That's exactly what this format of writing is designed for, a discussion afterwards. If your like to stay using an automatic mode for exposure then have fun. Your exposures for you subjects will not be up to you in most real world dynamic situations. In other words you will have much less chance to take creative control to use exposure to tell the story. You'll be stick only telling it with composition, dof, shutter speed, etc... You'll know I'm right the next time you shoot and you catch yourself continueing to look down at your histogram everytime light changes to make sure nothing is blown out. That's an indication that you didn't decide exposure for your subject, your camera did. making any creative decisions about exposure for your subject will be relegated to post. Your skin may come out muddy or post processed looking, or you just spend more time in post then you'd like. Contrary to popular belief there is right and wrong in this world. It's wrong to leave the lens cap on if you want light to hit the sensor. It's wrong to shoot jpeg if......(see above) and you want a larger color space to start editing from. It's wrong to shoot in any auto exposure (AV, TV) if ...( see above) and you want creative control of exposure of your subject in any real world dynamic lighting scenario. That's why I asked the question to Darlene, or anyone else who thinks I'm wrong. I'm anxious to here a response. If in wrong Im happy to switch camps. Mark, let me quote the beginning of this article: "You may have heard that once you get a DSLR you need to learn to shoot in manual and only ever use that mode. That if you are using the Aperture or Shutter Priority you’re cheating and if you want to be more like a pro you have to shoot in Manual only, all the time." And here you are. There is no 'only right way' to do anything. Aperture, Shutter, and Manual all have their usefulness in different circumstances. This article is a beginner's introduction to different shooting modes, not a course on metering or colour balance or a comprehensive photography course. Evangelizing about 'your way' is never productive and all too often misleading to beginners. Next you'll be telling us that RAW is the only way, and that too can be BS. Darlene has nothing to prove here, what she taught is correct. Your 'challenge' is irrelevant to this article, which is aimed at beginners, not at people desparately trying to prove they know something more than the author. Give the beginners time to learn, one step at a time. This is a good discussion. Hopefully the author appreciates the discussion here. I know this whiles musk mode only sounds silly. It sounds harder and longer and pointless. I don't use the camera meter like either of you describe. I don't use it to just get 0 EV. Darlene you say I'd have the same problems but I don't. It's like John says. If you allow the camera to change the amount of light for you then it will mess up. Since you understand the three inputs to exposure you should take that control from your camera by using manual mode bc auto modes mess up exposures in most dynamic situations. One reason is, if you are shooting a wedding and the bride is walking down the aisle and one moment has a bright window behind her and the next a dark curtain. Your camera, depending on its metering mode will jump around on total light coming in. Her skin will be dark in one image and light on the next. Your technique would require EV adjustments. My technique is faster then any auto mode because I set up the exposure for the skin ( or any subject) at the EV ( AKA zone) for that light and then I take pictures. The background will not change the exposure of my subject. Darlene's can not say that. You can't do an EV adjustment as she walks down the aisle. For one it would take too long. Two you'd have no feedback mechanism telling you it worked. The histogram certainly won't. So what I do is use the cameras spot meter to set something of a similar luminance to the EV I want. My blog explains the technique for using my hand to do this for skin. It's even easier if you are shooting a landscape shot. This may not sound faster but once I do this I just have to watch for changing light in my subject. ( a thing direly important anyway) If its not changing click away in any composition. Background luminance can't mess me up. If light does change on the subject I redo the technique. The thing is is light changes I the subject then that typically means light is pretty dynamic. That's the case that auto systems fail right out. They have no idea what your subject is. The have no idea what to exposure to middle grey, 0 EV. This doesn't even get started on the fact that a white persons skin is not that zone. So your camera usually frugally is attempting to accomplish the wrong exposure. That's why choosing the EV for your subject ( not your scene) is the way to go. Darlene, what would you do if you had to photograph a 4 year old standing in snow with dark trees behind him on an overcast day? What mode would you be in?. What would you do if you wanted to shot him from high up and have the snow behind him in one shoot and down low with mostly trees in the next shot? @john aspden - well said thanks! However, like I also said to each their own method. If John's way works for him that's great, keep doing it! I've tried, but I have a hard time to understand the "I shoot only manual" mentality. For Aperture Priority, I set the Aperture, and the camera, based on the metered exposure, sets the shutter speed for me. In Manual, I set the Aperture, and then check the meter in the viewfinder, and adjust the shutter speed so that the viewfinder shows 0ev exposure. Seems that I’m working harder in the second case to achieve the same result. Given that, I can't agree with Mark when he says that it's easier and quicker. In addition, the exposure can't be better if you're using the camera's metering. As Darlene says - in the "automatic" mode, creative changes to the camera's metered exposure can be quickly achieved with the exposure compensation setting. This way you make manual adjustments to the camera's calculation for the few cases where you need it, rather for every single shot as in manual mode. I can see john's point, where in his case he's enforcing his own choice of both shutter speed and aperture, and then adjusting for the correct exposure with the ISO setting. But I think most folks would rather control their ISO before the other two. For me, the biggest reason to shoot manual is to force yourself to look at the metering information in the viewfinder; there is a tendency to get lazy and rely on the camera to "get it right" - you set the aperture, and know the camera will select the shutter speed to get the calculated exposure (I deliberately didn't use the word "correct"). If you're not paying attention in the way that Darlene recommends, and you don't check that the camera-selected shutter speed is still high enough to prevent camera shake, then your photos may be blurred. So my advice is: force yourself to use manual mode when it doesn't matter. Just go out and shoot, with the aim to get well-exposed and sharp photos of anything. By doing so, you will learn to look at the settings displayed in the viewfinder every time you shoot. When it matters, and you may have less time to think, use one of the priority modes, and the habits of checking the viewfinder gained in your manual exercises will ensure that you notice when the calculated shutter speed or aperture are not ideal, and will give you the chance to adjust the ISO to compensate. @don yes that is true is you have "auto ISO" turned on which I recommend not doing. It's often choosing a high ISO when you may not want it and you'll end up with overly noisy photos. I recommend turning that off and selecting the ISO yourself. @Mark thanks for your comment. I still find you'll have the same issues in Manual if you set the exposure to the Zero mark. You still need to use the right metering mode (which I didn't get into here that's a whole other article) and know when to override the camera meter to make your own adjustments. I can do all those same things in Av or Tv using Exposure Compensation and for me it works faster. If you've ever tried to shoot a wedding, you'll find out real fast that Manual is too slow you'd be changing exposure ever 2 seconds and for every shot and you'd end up missing some. In cases where you need to shoot faster, it's okay to let the camera meter and set the shutter speed IMO. @john in theory that should work but there's something that seems missing in your steps. If you pick the shutter speed first, let's say 1/500 to freeze motion of something, then you pick f5.6 cause you want a little DOF to make sure you get it in focus, but if it is dark out or you're indoors your ISO might end up being 3200 or higher and a noisy image. As for Av choosing a slow shutter speed, like I said you need to keep an eye on that and if it goes low then bump the ISO. Bottom line is if you've already figured out the best way to make it work for you and you're getting good results then run with it. If you are new to shooting in these modes my steps are a starting point to understand it, then once you have the basics you can figure out if there's a way that makes more sense to you. I nearly always use manual (Canon MkII). I don't like AV because lighting conditions can change quickly - as quickly as looking from left to right - which can quickly slow the shutter speed, hence blurring a lot of shots. I pick shutter speed first based on the activity being shot; then, the Fstop because that doesn't change too much within a given shoot for me unless there's just too much light; finally iso, based on test shots for how the exposure is from the other two settings. Shutter speed is set to whatever the activity is so that I don't get blur; f-stop for the DOF I want. Then, set the iso to get the correct exposure and light. All of this means that I'm constantly changing setting while I shoot, move around, etc., but I control it and it has become second nature. This article is a great primer for you if you are just learning what Aperture, Shutter Speed, and ISO do to exposure and their side effect. I think though this is the ONLY time you want to use AV (A) or TV (S) though. These modes are still auto. They still rely on your cameras spot meter to decide what should be at a certain exposure. Depending on your metering mode they are fooled by bright sky's, dark backgrounds or moving the camera. Shooting in Manual mode, once you know the fundamentals of aperture, shutter speed and ISO, is easier, quicker and always yields shoots with better exposure. You just have to know a couple camera settings, like metering mode set to "spot". Then you have to know what to point the circle in your viewfinder( your cameras spot meter) at. I explain the how, but not why, for doing this with portraits on my blog technologyformedua.com. Its the article called "Manual mode us cheating". If you subscribe ill soon be posting the whys and all the settings I use in my camera and why. Again this is the best article I've seen on this subject. I'm going to point my readers here. But it's only a first step. Using manual mode is not an elitist thing. It's just easier once you know the basics. I always use manual but in some critical situation it these exposure mode saved my life. I've found Aperture priroty mode to be very useful, but I choose the DoF first and then select the ISO based on shutter speed requirements. In this photo I selectd f/4.5, then increased the ISO to 800 to get the shutter speed to minimum for a hand held shot. Rob what lenses do you have? Getting a lens with a bigger aperture will make a big difference. Go grab yourself a little 50mm f1.8 it's one of my favourite lenses and it's costs like $100 bucks (not sure how much in pounds). What it does is allows you to shoot with a bigger aperture and not need the higher ISO so often. I use it a lot when shooting indoors or at events. Looks like we're on the same page here with the exception of my ISO usage in either Av Tv or M.
I only recently learned that I can comfortably use up to iso 800 on my Canon 7d in any situation. my Canon 7D will select both speed Tv and ISO when in Aperture mode and ISO is on Automatic. I believe this was also true on my old Xsi. Similarly in Shutter mode Tv the camera selects both Av and ISO. So in both cases you only need to choose either Av or Tv. Very very nice, Darlene . . . I really like your style. I hope that you are not against my using your reference with my students as I see you as a very inspiring lady.